If you missed the first post in my Mini Series, check out what I think is the key first step in getting ready for your first craft show... Designing your "Feel." Who will be there in addition to your target audience? Kids? Weary husbands? Do you have something for them to make their stop easier? Think: candy, chairs, etc. What will people do in your booth? If they have more things to do they will spend more time in your booth. More time in your booth = sales! In my case, I wanted them to be able to try on scarves and have a place to relax or place custom orders. I made a fitting room of sorts with a few scarves on hangers so people could try them on and so I could show off the different ways to wear the scarves. This was key! I was able to up-sale a few people who were "only buying for a friend" or who may not have bought one, but folded when they felt how warm and soft they really were! I also made sure that I branded everything they looked at (more on that later). I had business cards and my scarf enclosure cards at eye level encouraging people to take a look at my blog as well as my Etsy shop. Don't underestimate the power of your packaging! My packaging did double duty as display, protection of the scarves and easy wrapping for gifts. I ordered these boxes from PaperMart.com and was pleased with them. They ended up being about $1 each, shipped to my house. That's expensive, but you've gotta spend money to make money. Also, don't underestimate the power of lighting and fresh flowers. There's just something about fresh flowers that's cozy. I made my sign using freezer paper stenciling. It was really easy to do and added a lot of impact to the back wall of my booth where your eye would naturally land when you were walking by. Plenty of people make the mistake of putting a sign on their tablecloth. The problem with that is when things get busy you can't see your sign, so make sure that sucker is up high enough! People need to know who made this stuff! As much as I would have liked to have had personal conversation with every single person who came in my booth, it just wasn't possible because of how busy it was. There were a few points about my products I wanted to make sure people were aware of, so I made little talking point bubbles and placed them around my inventory. This one reads "Each of my paintings are one-of-a-kind. I do not sell prints, so you can be sure you have an original piece of art for your home." You get the point. There's an adorable shop in Raleigh that does this beautifully, Ornamentea. I got the idea from them. My tiny little laminating machine got a workout before this show, I'm telling you, that was money well spent! One other recommendation I have when designing your booth is to think about the future. Maybe you'll sell out of a certain color (hopefully!) I had a color board with my yarn samples so people could place custom orders. I had quite a few custom orders placed for baby hats and I'll show you the order form I made up in another post. Loved these tiny chalk boards to show the prices of my inventory! (Michaels' dollar bin.) I found this much more effective than pricing each individual item. Finally, think about the questions people will ask you and see if you can answer them before they are asked... what's your name? Wear a branded name tag. Do you take credit cards? Show a laminated list of the cards you accept (I used the Square... loved it and I'll tell you more later.) Do you gift wrap? Have branded bags at the ready. Here's my little workstation at the show, tucked away and out of sight with everything I needed. Branding is my next post in this mini series, I'll show you how I did it all myself and on the cheap! 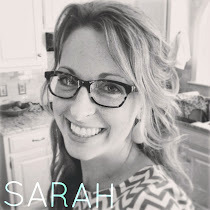 i love these posts, sarah! so proud that you did this!! how do you accept credit cards? did you buy a cube thingy?? I LOVE your idea of adding chairs and treats to your booth for tired family members. wow!!! what a beautiful creation!!! i wish i could go to visit your booth. Looks great! Love your packaging and display for your scarfs! When will we get the next one in the series?! I have my first show at the end of January and your posts have been invaluable in helping me get ready for it! Yay, I love hearing that this series is helpful to you all. I'm having run writing it for you! There are just so many golden nuggets that I found and figured out about my first craft show and I'm happy to share!